Visual Lottery Analyser is state-of-the-art lottery analysis software with many unique features. It works with almost all lottery games in the world. 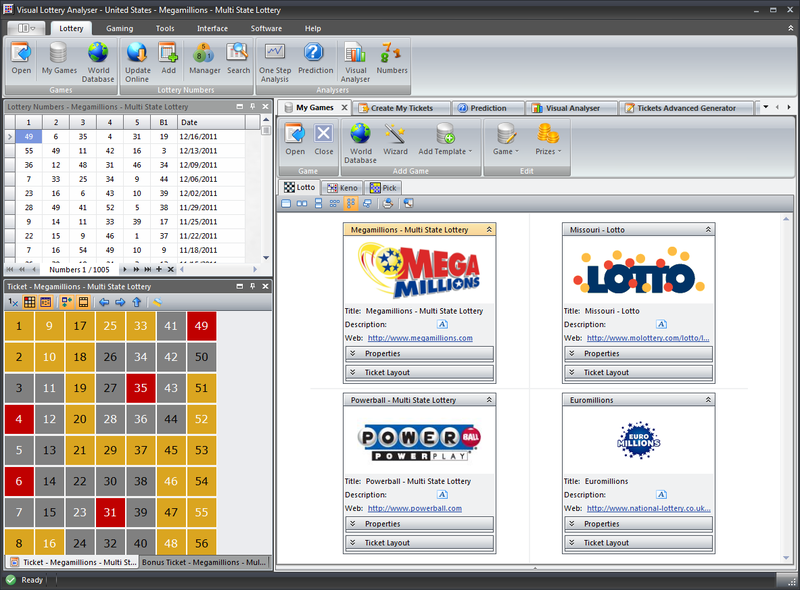 It introduces a new lottery theories and new innovative visual analysis methods: Geometrical Ticket View for showing lottery game view at hand, new Contact and Outside numbers, traditional Hot and Cold numbers and other. Whether you are professional player or beginner here you will find everything that you need to create tickets, play, analyze, calculate and keep statistics of your lottery games. Software is fully-automated. It has One Step Analysis - a feature that lets you get the results in one step only, from downloading the latest drawings, analyzing the game automatically, getting the possible numbers to play, generating lottery tickets to showing tickets and finally printing them or sending SMS etc. Prediction -- an automatic feature that analyzing game and showing you ranked numbers from the most possible numbers to occur to the less. You can also analyze games manually and visually. Instead of looking on columns with numbers that do not tell too much, you can now know how the numbers may go with taking one look... analyze single numbers, groups/blocks of numbers, special numbers, numbers in vertical or horizontal lines, by the date etc. Create My Tickets, Tickets Advanced Generator are for creating smart lottery tickets accordingly to the software rules or your rules. Create My System is a powerful feature dedicated to work with wheel systems. 2100 wheel systems are included. You can use them to create lottery tickets by replacing system numbers with yours and apply filters to the system. Other major features are: World Games Database, Drawing Online Updating with past drawing, My Tickets Manager, Notepad, Financial & Hits Statistics, Search Drawings and Wheels Systems Editor, Check Game Results, Numbers Report.